By committing to the My Alberta Directory - 45 DAY MARKETING CHALLENGE you agree to supply 7 Points Media Ltd. and its division “The Sylvan Lake Directory” with all relevant and related media material and information required to create an active and fully functioning on-line profile of your business. In turn, 7 Points Media Ltd. will produce for your business an Online Profile on www.myalbertadirectory.ca on your behalf, at no charge for the 45 days. No information within your online profile will become public until an agreement has been signed by the owner or authorized representative of your company and your online profile has been approved by your respresentative for public viewing. Should the analytic results of the My Alberta Directory - 45 DAY MAREKTING CHALLENGE prove to show a minimum of 45 detailed “Impressions” or “detailed views” of your online business profile within the 45 day period, you agree to commit to a 12 month subscription of advertising in the “The Sylvan Lake Directory” and/or “The Lacombe Directory” printed book and on our website www.myalbertadirectory.ca for the 2019 edition. Should the analytic results of the My Alberta Directory - 45 DAY MAREKTING CHALLENGE not prove to show a minimum of 45 detailed “Impressions” or “detailed views” of your online business profile within the 45 day period, you will not be charged for the 45 days of online service and your profile will be deleted from our system permanently and you will not be obligated to participate in the 2019 edition of our published books and no monies will change hands. You agree to actively monitor your online profile’s traffic analytics for the 45-day period of the challenge for which 7 Points Media Ltd. will give you password access. Traffic analytics results are organically grown and may not be manipulated by 7 Points Media Ltd. or its divisions or by the participating partners within the challenge. The 45 DAY MARKETING CHALLENGE begins the moment your on-line profile becomes active and your contract is signed and continues for 45 days until the challenge is complete. Upon completion of the 45 DAY MARKETING CHALLENGE, you agree to meet with 7 Points Media Ltd. to evaluate the results of the challenge to determine whether or not you are eligible for the 12-month commitment upon clarification of the final results. 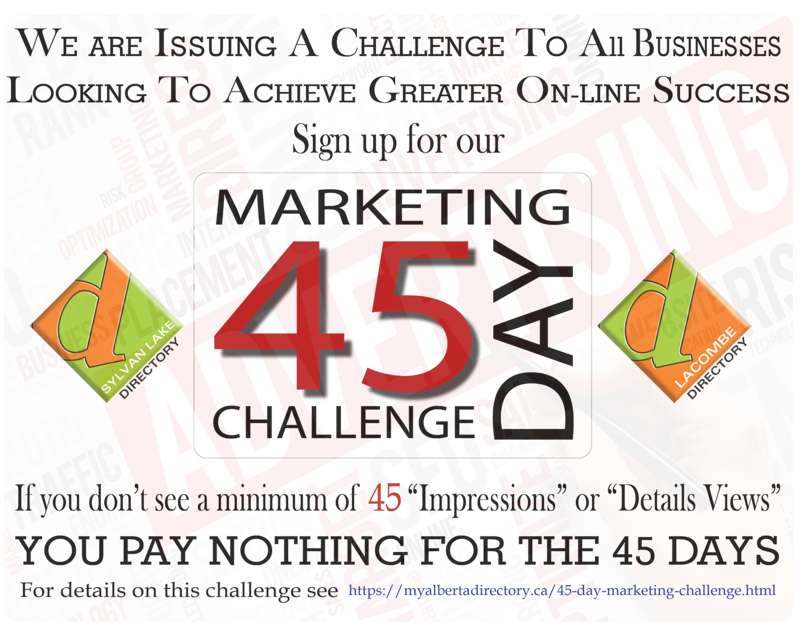 The 45 DAY MARKETING CHALLENGE may not be combined with any other offer and is not eligible to any clients already actively participating in any of our advertising programs. Should your online profile analytics show your business qualifies for the 1 Year commitment to a 12 month subscription of advertising in the “The Sylvan Lake Directory” and/or “The Lacombe Directory” printed book and on our website www.myalbertadirectory.ca for the 2019 edition, total value of your participation will be based on a half page ad within our published book and the on-line profile we created with a total cost of $458.33 Including GST after a 10% discount on pre-paid purchases at the time of signing for a period of 12 months.